Day three, last day! I always get a little sad on the last day, because SES is so much fun! 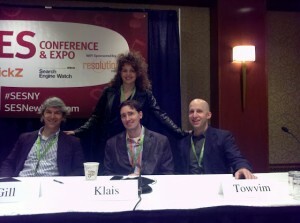 Now I’m attending a panel of incredible mobile experts, which is moderated by the lovely and talented Angie Schottmuller. On the panel we have Daren Gill, Brian Klais, and Adam Towvim. Brian is up first. He used to work for NetConcepts before they were acquired by Covario, and now works for Pure Oxygen Labs. 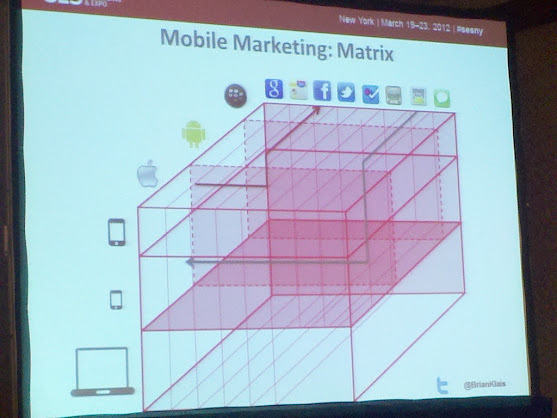 Web marketing is linear, but mobile marketing is more of a three dimensional matrix. Never add tracking parameters to the URL itself, do it with a redirect after the fact. 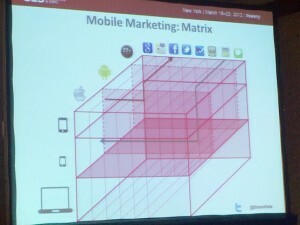 About 50% of FB and Twitter traffic is mobile, FB is #1 mobile app. Don’t force mobile users to login. But remember, not all users will have the app installed, some apps are inconsistent with URL schemes, and each OS handles errors differently. Now up is Daren, from Veveo, Inc.
Can your phone learn and personalize? How can we increase relevance by deep linking into the app instead of just going to the home screen? What are the tradeoffs between privacy and learning/being smart? He walks us through a day in the life. Traveling, meeting, adjusting flight itinerary, checking where the meeting is, looking for your favorite coffee shop… but this is something we all go through every day, and it’s too hard. He asks, why was that so hard, isn’t your phone supposed to be “smart”? What if your phone could ask you if you want to add your new meeting to your calendar? What if it added the location and a map? Why couldn’t the map use other info stored in your phone to also mark your hotel, your favorite coffee shop, and the possible locations of the meeting? Even more, why couldn’t your phone know that you were out of your normal area and let you know, you’ve got some extra time, here are some places you might like to go based on your history? What if it knew how far it was to your meeting, and gave you a reminder based on your location and how long it would take you get there? This should be possible, and this is what we are trying to do at Veveo. Jumptap reaches 90%+ of smartphone users in the US. 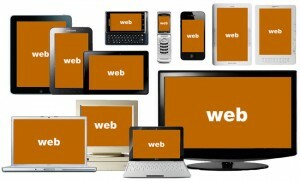 Reach is important for mobile. Blend Brand and Performance: you need to be aware of how branding campaigns impact your lead gen/downloads/etc. 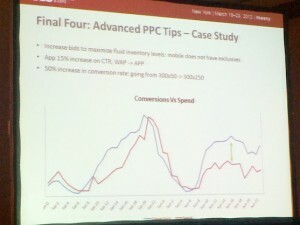 Able to target based on products, stores, cars, demographics, etc. Rich Media as new metric – it offers the opportunity to bring customers into the experience: rotate images, change colors on products, etc. 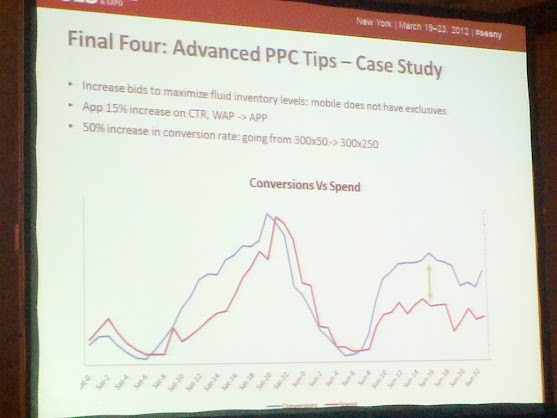 As the “Final Four” reference, he offers an Advanced PPC Case Study that shows that by increasing bids to maximize fluid inventory levels, there’s a 50% increase in conversion rate over time, primarily with latent conversions after you’ve already lowered your spend.